Running a vintage company is more than just a job. We don’t do it for the money, we don’t do it to feed people a line. It’s about being part of something creative, and being part of the community. Seeing our clothing or tote bags out and about make our day. It’s great to see people interacting with our brand, and being proud to be associated with what we have built. Through running various events, gigs, podcasts, poetry, yoga, and vinyl events for free, we have met so many amazing people, both performers and audience members. Made new friends, and probably upset a few too. We have a space, that is more club than shop. Where we can all hang out, have coffee, listen to music, read and chat. 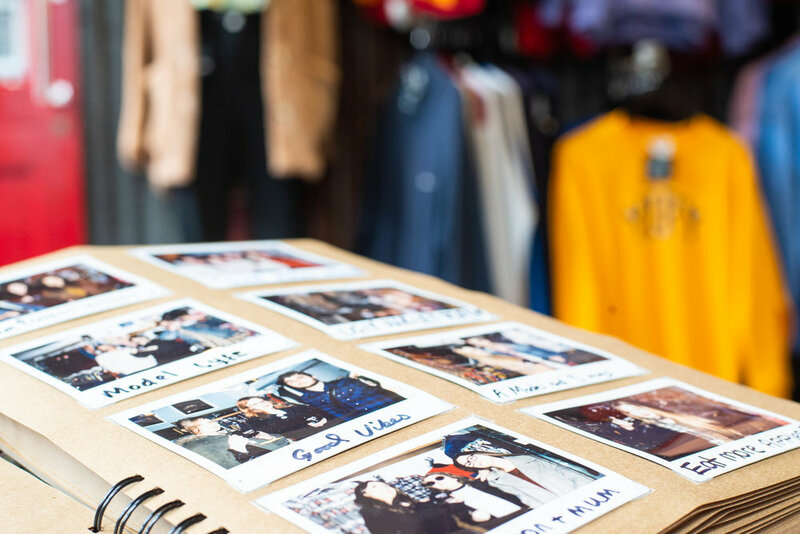 The BDV polaroid photo album, featuring some of our most loved and regular customers. The feeling of being part of Colchester is the reason we get up in the morning, and 'most of the time' don’t moan about it. We hope that what we offer you guys, above selling unique clothing is what keeps you interested in us. It’s really important to us to stay relevant. We have spent muchos time in the last few months figuring out a way to be authentic and helpful in our town of Colchester. Whist balancing the financials of running a business. We kind of figure that it's right to be honest, and say that we are a business. Yes we aim to make profit, but that’s only one part of why we do this. We want to help out our customers, artists, and musicians to realise their dreams. Partly by giving them a space to be able to use, giving advice, and promoting their endeavours on our social media. Our Failed Rockstar Club. So if you have a quirky event, idea, or need a space to promote your event…come in and speak to us, leave a comment here, or message on the old socials. It’s free to use in the evenings, if its a worthy, or artistic event. We give our space, and time to help you out.